The Tap King out of the box. As a country Australia may not make a lot of whisky (though we should) but we sure as hell make a lot of beer. In light of this as always I am keen to extend our clubs range of undistilled whisky knowledge. Sit back and let us examine a little more about one of our countries greatest inventions of the 21st Century, the Tap King. When I heard about this release mid last year I could not believe it was actually true. I just had to get out there and purchase a Tap King as a Father Day Present to myself, then of course for my father and yes also the father-in-law The Grey Bush. I mean seriously, a beer tap in the fridge is a dream come true for any domesticated male. As quoted from the Tap King website "Tap King is not just the greatest technological breakthrough since the wheel, it’s also a way of life. Welcome to the Tap Kingdom". Move aside Game Of Thrones my frosty kingdom is now my trusty refrigerator and it welcomes me daily. 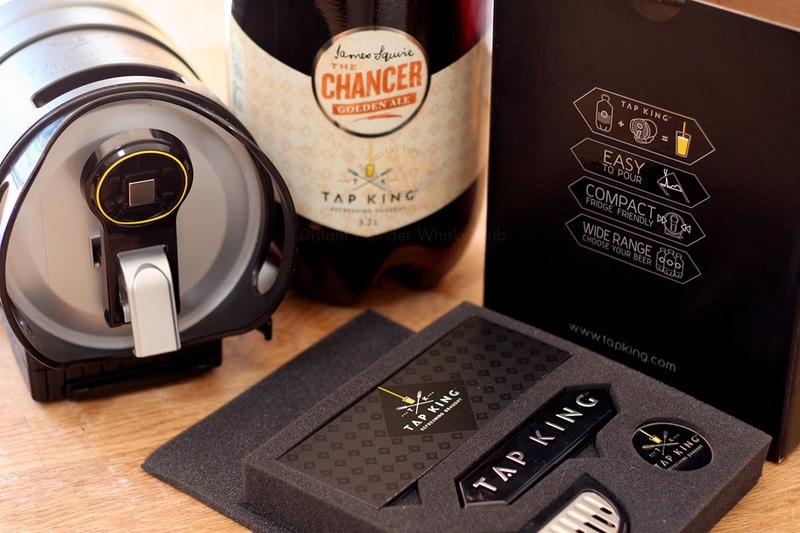 The Tap King is a Lion product and was released in July 2013. Lion, formally Lion Nathan until 2011, is considered Australia's largest beer brewer. At the time of the Tap King release we saw a series of 6 beers that were available to purchase in single or double keg packs: Tooheys New; XXXX Gold; Tooheys Extra Dry; Hahn Super Dry; James Boags Premium; James Squire Chancer Golden Ale. To this date this has not changed but it would be great to see some other beers come to the party. It is safe to assume until Lion licences to other parties the Tap King system it will only be additional Lion family brands released. Still for everyday drinking beer the line up is great. Regular every day beer on tap and leave the bottles for the craft brews. The advertising campaign for Tap King is outstanding in my books and absolutely classic that they were able to secure Lionel Richie to play the part and sing that classic song "Hello". If you read comments across the internet it is believed Lionel Richie has enjoyed a renewed interest in the music scene globally due to his appearance in this ad campaign. How true is that? Maybe not that much and I could not find and solid source to prove it. Anyway the dude is pretty cool back in the 80's to now and if anything he has brought instant respect to the product. Of course Lionel Richie may not be supporting this brand forever so Tap King has it's secondary characters Charles The Firth, played by Charles Firth, and Harry Wizenhiemer Professional Tap King Instructor. Both of who introduce the Tap king in a series of short videos taking you through the ins and outs of using your Tap King. Economically it is still cheaper to by the beer in the bottle as it works out to be 10 bottles of beer to a 3.2litre keg. So why is it not cheaper as the shipping, storage, and packaging is less? Just have a look at the plastic kegs themselves, the mechanism for locking in and the CO2 cylinder contained within every keg. Personally I think the pricing is actually quiet good for what you get and the convince of having Lionel Rich hand you a beer every time from the fridge (metaphorically speaking). So let us unpack the system and just look at what you get and how it works. 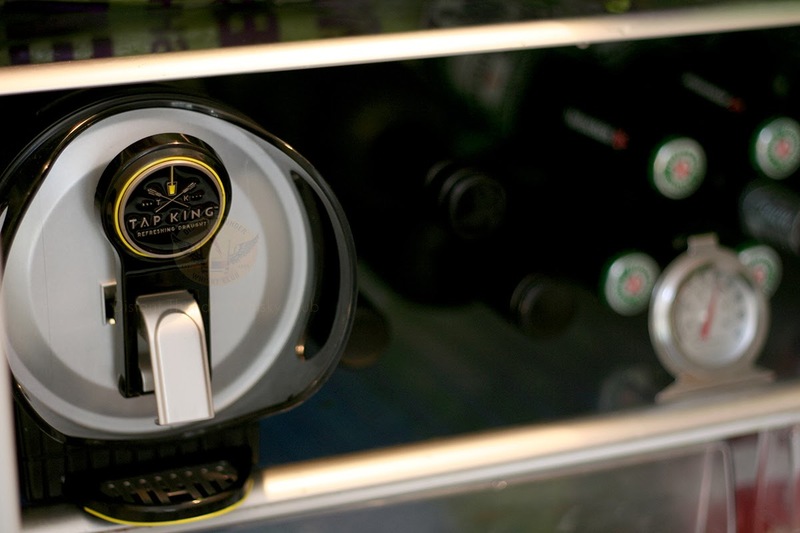 The Tap King is made up of 2 integral parts: the Tap King Dispenser, retailing around $33.99AU; a plastic 3.2 litre keg, retailing between $18.99 up to $52.49AU depending on contents. Installing the Tap King dispenser is a pretty simple task. On opening the well presented dispenser box is a foam insert with simple to use instructions, retractable dispenser drip tray, magnetic dispenser badge, and plastic keg release handle used for recycling the kegs (not really needed as you can screw it off by hand anyway), and then below is the all in one dispenser itself. Pull it out and your already 50% of the way there. Turning the dispenser over and looking inside it is also all pretty straight forward on how it works. complete the setup by attaching the retractable drip tray, you will find some grippy handles for easy management in and out of the fridge. Apparently the whole thing is also washable though I would caution submerging it in anything apart from beer. The kegs themselves are also very easy to store and connect to a dispenser. Each keg comes with its pre fitted connector that simply peals away to revel the pluggy bits and a large silver arrow makes it dead easy to know just which way to match it into the dispenser. Once the keg is married to the dispenser a simpler leaver is pulled down that makes the final airtight connection. The last stage is simply laying into the fridge in a position that is easy to get at and start dispensing liquid gold. I have found it is good to let the keg rest a few minutes if you don't want a massively foamy head. First pours are usually foamy anyway as the pressure is needed to equalise though I have noticed a varied level of pressure from keg to keg so some will foam a lot on first pour while others hardly at all. The Tap King Setup and ready to dispense. 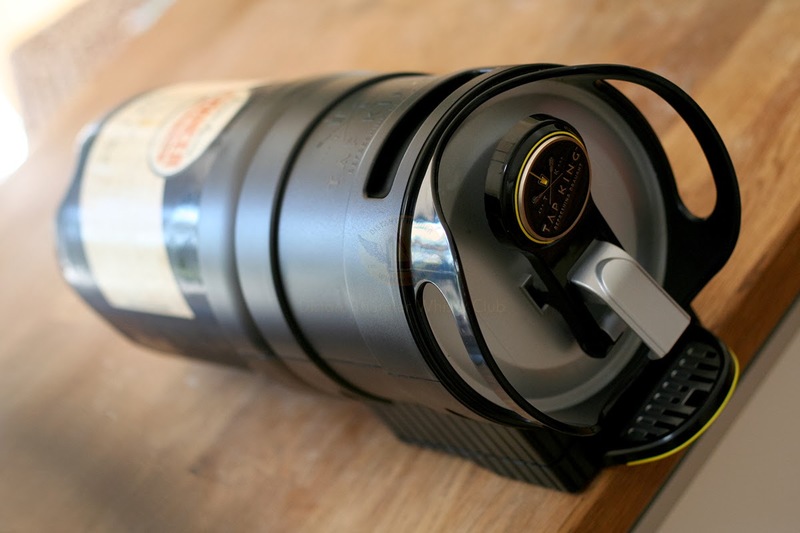 When a keg runs dry it is simply a case of pulling out your next keg (that has been previously chilled in the fridge), then taking the Tap King dispenser and releasing the locking handle, pulling out the old keg and inserting the new, pull back down the handle. For the used keg unscrew the cap so the plastic keg can go in the recycle. So how long does a keg last? Well if your like me usually a couple of weeks at best. It is recommended to drink within 21 days of tapping but I have found after going on a recent holiday that it retains pressure well and truly past that time period. Outstanding! Easily fits into any standard fridge. I am very happy with my Tap King. It is a hands down right on the mark product that is presented well, fills a clear market gap, and has very little that could go wrong with it. From box to fridge you could be poring a draught beer within 2 minutes provided you chilled your kegs prior. Swapping out a keg for a new one can be done is less than 30sec easy. If I was to give a dram an easy 6.75 out of 7. If you do not have one of these I certainly encourage you try. Hello ladies!